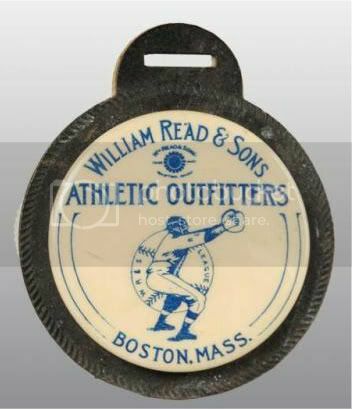 This William Read watch fob has a celluloid button with the image of a catcher with the score keeper on the back side. Beautiful condition and pretty cool looking. I know people are having trouble reading this thread and I'm working on fixing it. Thanks for your patience. Here are a couple of catalogs. The first is 1904 and the second is 1911. Not sure how much baseball stuff was in them. 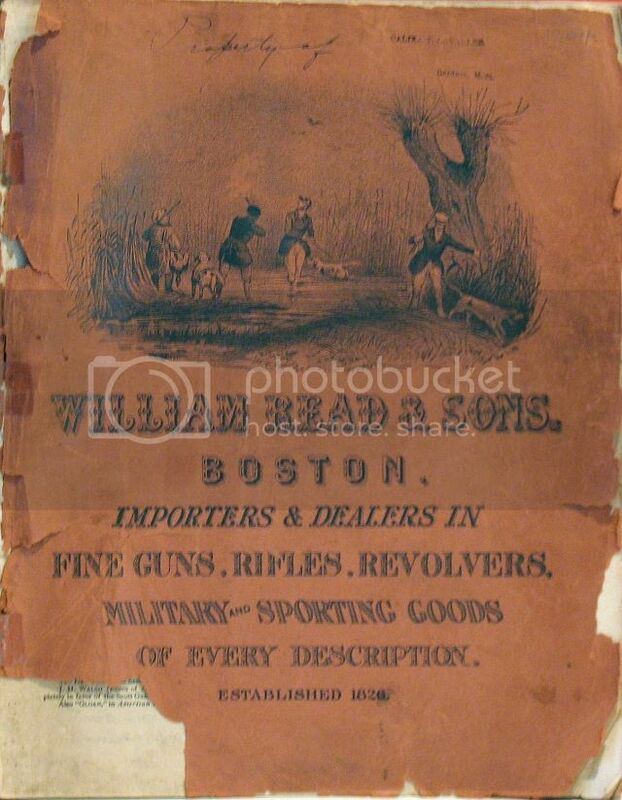 William Read moved from Market Square to Faneuil Hall Square in the mid 1800's. The marketplace was pretty congested back then with narrow, oddly angled streets. It looks crowded even in this 1920's photo below. Wm. Read moved to more spacious headquarters on Washington St in 1885. Iver Johnson and Wright & Ditson were also located on Wasington St. Below is the last location of Wm. Read & Sons, 364 Washington St. in Boston. That photo was taken in Brighton, which is a Boston neighborhood, but not the correct address. This is why everyone gets lost in Boston. There is a Washington St in every neighborhood, or so it seems. What is likely to be the correct area is the downtown section of Washington St that runs from the South End to the North End, specifically the stretch from what is now Downtown Crossing into the North End. That was the major leather tanning and manufacturing hub back then. A portion of that area is now known as the Leather District, even though all the tanneries and manufacturing are long gone. I suspect that the correct address was demolished when Scollay Square was leveled to make way for Government Center in the 1960s, but further research would need to be done to confirm that. Mike your research is amazing! You should consider printing all your work into a pamphlet or booklet for everyone to enjoy and become a resource for future collectors! Mike blows me away with his diligent research and revelations! Yes! Wish your work could be compiled. Know it's a labor of (g) love! Makes this web site invaluable. I was hoping a Boston resident would chime in on this. The earlier Wm. Read address of 107 Washington St. showed a residence on Google Maps so I was a little bit suspicious. When I looked through the moves of Wm. Read & Sons, I noticed a lot of downtown redevelopment transitioning from horse and buggy days to car traffic. I looked into this a bit more. I don't think either building is still standing. The first building at 107 Washington St would very likely have been located in Scollay Square, now long gone. 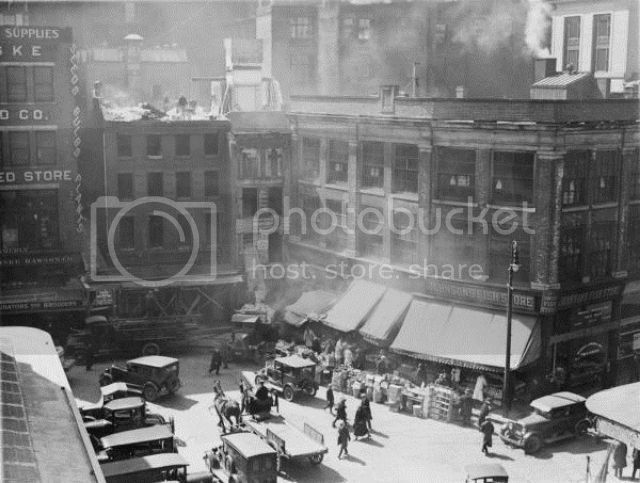 The next location at 364 Washington St would have been located in what is now Downtown Crossing. That area has seen a tremendous amount to redevelopment over the last 20 or so years. There is a large open area where I believe that building once stood. If you look at Washington St on a map you can see where it ends abruptly at Court St. That is the Government Center area now, which was once Scollay Square. Government Center is directly across from the Faneuil Hall Marketplace, which makes sense for a storefront, especially at that time. If you draw a straight line from Washington St at Court St directly north you will come to N. Washington St which would have been a continuation of the same road prior to being redeveloped. Just to give an idea of how ridiculous navigating Boston can be, after a quick glance at the map, I can see Washington St addresses, all of which are within the city of Boston, with different origins and destinations. From Roxbury to downtown, then N. Washington through the North End. From Dedham to Dorchester. From Newton to Brighton. And small stretches in Hyde Park, Roslindale, Charlestown, Jamaica Plain, and Dorchester again!!! I don't know if they were made by Stall & Dean or not, but this Stall & Dean buckleback looks very similar and has very thick leather. It's a beast! Check out the cloth logo on the front side heel which is actually the older Stall & Dean logo. Here is a Wm Read & Son Infielders mitt that I've been infatuated for a long time and can finally say that it has found it's way to my collection. My sincerest thanks to Dan H. who was kind enough to put up with my good natured nagging and ribbing over the past few years. The leather on this mitt is very soft and supple and once you put it on your hand, you don't want to take it off. Although the stampings are worn, the tag is still intact and displays well. Like my buckle back fielders glove, this one has the neat looking arrow strap as well. The construction of the mitt is quite unique and the catalog pictures don't do this glove justice. I can see why you kept after that one. The horseshoe lacing around the body going past the thumb and the web sewn unto the thumb and laced through grommets to the body of the mitt can only be described as Wow! That doesn't even get into the Wm. Read patch and arrow head wrist strap with quick release buckle. Quite the find. Here is another mitt with the same horseshoe lacing. This one is a D&M "Babe Dahlgren" model possibly from the mid 1930's. I guess that design hung around for a few decades. It is pretty cool looking and provides easier access to the padding inside and less stress at the thumb connection. 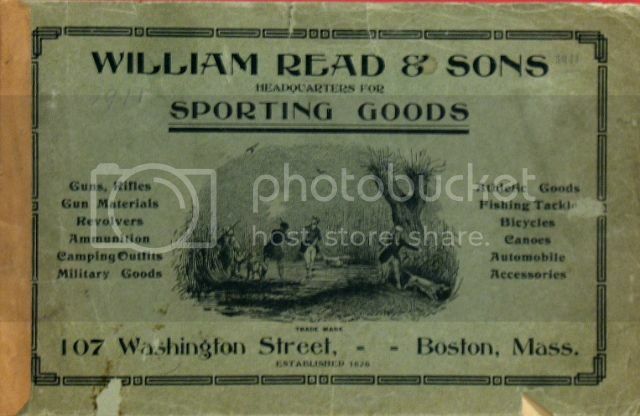 Here is a page from a circa 1913 William Read catalog - you can see that it's later than the other stuff we have posted due to the logo change (READ).